Try this yogurt bowl to help fuel you for a great, energized day! This easy to make yogurt bowl is an easily made breakfast and can be made with dairy or can also be made dairy free, and has other nutrient rich ingredients blueberries, raspberries, chia seeds, and goji berries. Choosing your yogurt is an important part of this breakfast because yogurt can be loaded with sugar and other additives. When choosing which yogurt to buy, take a look at how many grams of sugar per serving, pay attention to the ingredients in each (it’s important to be able to pronounce them!). Choose plain or vanilla yogurt and add your own fruit or honey for sweetening! Try this easy yogurt bowl for your next breakfast that will leave you feeling satisfied, and here’s a few facts about the ingredients. Enjoy! Yogurt is a power food to start the day because it contains healthy bacteria (probiotics) that are beneficial gut health, brain health and more. The good news is that both dairy and non dairy yogurts contain healthy gut bacteria. Blueberries are packed with healthy nutrients like heart-healthy potassium, brain-healthy folate, vitamin C- good for the immune system and also an antioxidant, energizing vitamin B6, and more. Raspberries are rich in vitamins, antioxidants and fiber. They’re a source of ellagic acid, a phenolic compound that may help to slow tumor growth. Chia seeds are source of essential fatty acids- the plant based version of omega 3 fatty acids- alpha linolenic acid (ALA). 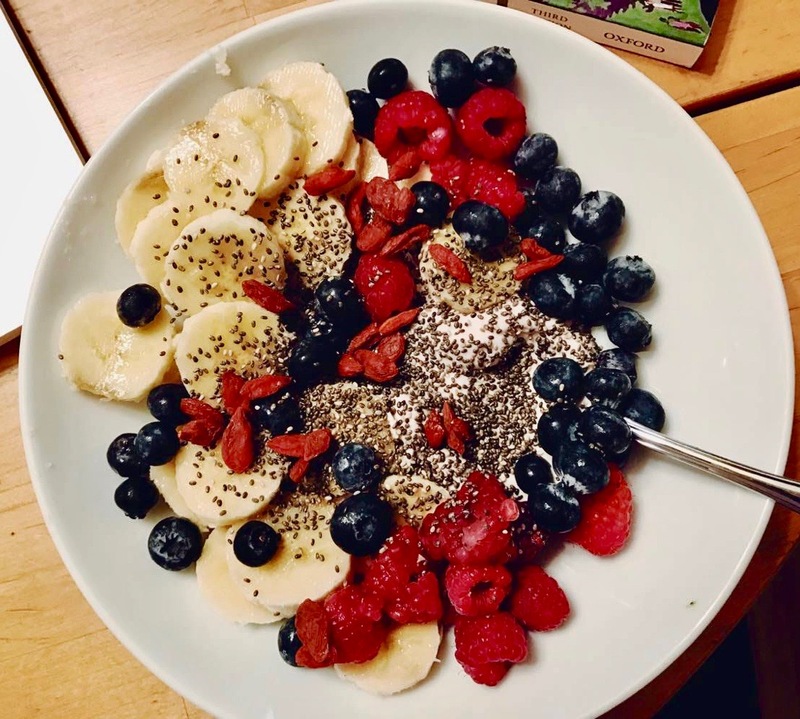 Chia seeds also contain soluble fiber that’s good for digestion and are also a source of other minerals like calcium, iron, magnesium and more. Goji Berriescontain 8 of the 9 essential amino acids- so it’s almost a complete protein. Goji’s are also loaded with antioxidants and anti-inflammatory compounds like anthocyanin- so they’re a great addition to your yogurt bowl. Pour your choice of yogurt into a bowl, add the toppings!